Of course Al Green was the south’s biggest soul star in the early 70s and it is no wonder that other singers tried to recreate his winning formula. 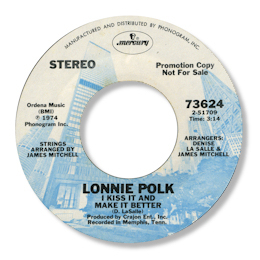 Sidney Joe Qualls made the most famous “homage” to him in his “I Enjoy Loving You” album, but this tasty track from the obscure Lonnie Polk may just be the pick of the Green sound-alikes. Unlike Qualls Polk went to Memphis to record I Kiss And Make It Better and the song features trademark Hi studios touches, the loping rhythm, Ben Cauley’s South Memphis horns and the masterful playing of the great rhythm section. The song itself is ridiculously addictive and the way Polk finishes it in double tracked falsetto is great. Close your eyes and it could be Mr Green himself. This is probably the least heralded track from Denise LaSalle’s Crajon productions.